JACKSONVILLE, Fla. (FNN SPORTS) – Despite being recorded as one of the hottest games played in Jaguars history, 68,527 fans were adamant about being present for the AFC Championship rematch at TIAA Bank Field Sunday. The AFC Championship was a nail-biter, a game the Jaguars controlled until early in the fourth quarter, before the Patriots defense wore down Bortles and maximized on the Jaguars defense being on the field too much. 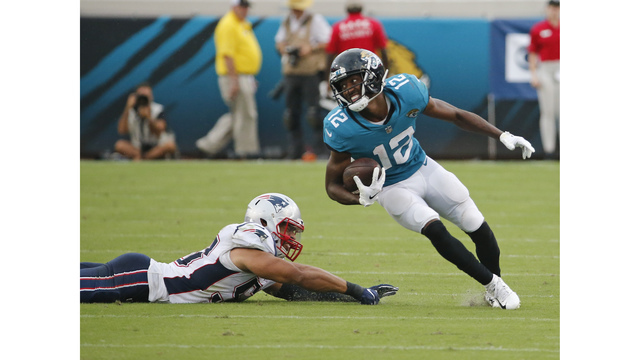 After the Jaguars suffered a tough 24-20 loss versus the Patriots on January 21st, eyebrows were raised at the potential Jacksonville had to win Sunday’s game and move forward. In this match, Jacksonville reassured fans that their hope was in the right place. From the beginning of the game Jaguars controlled the pace as well as the Patriots. The game opened with the Jaguars on defense and showing us early in the first quarter that they’ve still got it, holding the Patriots to an early 54-yard field goal attempt that Gostkowski missed. As the Jaguars offense jogged out to the field, I’m sure many were wondering: What’s the protection for Blake Bortles going to look like, and how efficient will the offense be without weapons Marqise Lee and Leonard Fournette? Bortles and the offense answered that question as they took over, roughly four minutes into the first quarter and nine plays later, Jacksonville found the end zone for a touchdown. Right out the gate we were seeing a different quarterback in Blake Bortles and his connection with two new weapons, Grant and Cole. Jacksonville’s defense had a field day containing Brady and the Patriots offense. Linebacker Telvin Smith had very keen vision out there, contributing to New England’s inability to get to mid-field. Jalen Ramsey backed up his words of “fearing no man”, as he continued to make his presence known off the field. It was not until the end of the third quarter and some of the fourth quarter that the Patriots started to finally get closer or past mid-field. The best they were able to accomplish was more field goals, until 3:48 left in the fourth quarter, when they finally saw the end zone. Unfortunately, the Patriots’ one and only touchdown came too late, as the Jaguars took their 31-20 victory once the fourth quarter wrapped. All in all, what a game and home opener for the Jacksonville Jaguars! Stay tuned with us at Florida National News as the Jaguars will be back home, hoping to continue the season with this momentum, versus the Tennessee Titans this coming Sunday at 1pm.